If you love dodging spikes by the thick of your teeth, then you're gonna love this new mobile title from Capcom Japan: Rockman Diver. Now available for docomo, au and SoftBank phones, Rockman Diver has you navigating the Blue Bomber as he dodges a bevy of spikes while plummeting down a deep blue abyss. Your score is based on how far you dive before making contact with the spikes: the longer you live, the higher the score. Along the way, you'll find recovery items that provide additional points. It's a simple little game, one clearly designed as a time killer. Currently only available in Japan; priced at 315 (per month) via the Capcom Party service. If you've got the means to do so, you can purchase the game by scanning a QR-Code at Capcom's mobile site here. That...is the most awesome mini-game ever devised by man or machine. I want it! Why didn't I think to make something like that for the v-cade! back before the big staff change a few years ago? omg this is the greatest thing ever! Does it play random chiptune musics including all water based levels with a rare instance of a chiptune composition of Holy Diver? Next up: "disappearing platform adventure!" That looks as if it came straight from Splash Woman's stage in Mega Man 9. In any case, though, it still looks fun. Wow... If this and a disappearing platform minigame happens.... I'm sure lots of people would buy it. But not me. Too much trauma in one game. Imagine losing all your 9 lives all because of spikes. Trauma!!! (Though I still finished the game eventually). OK, this is off topic, but can I really be the only Mega Man fan that realizes that the so-called "disappearing" blocks in the Mega Man games aren't disappearing at all....they're retracting into the wall! Hmm, what do these all have in common? Oh, that's right--the disappearing blocks in these screenshots all happen to be the exact same tile as the background. You'd think Dr. Wily would just once try to be a little more original when making "disappearing" blocks. I present this comment as an open to challenge to anyone to justify the notion that Mega Man games have disappearing blocks. As far as I can tell Sheep Man's stage was the first to have blocks that appeared to be totally separate from the wall behind them. Sheep Man was as far as I can tell the first and only one. that is rather ingenious. I'm surprised no one's thought of making this into a game sooner. - Astroman stage, Rockman & Forte. - Burstman stage, Rockman 7. Those are the only stages in the classic series where there's a "background mismatch". Yes, even Heatman's stage in Rockman 2, but only on the highest and lowest Yoku Blocks. The other two stages give the impression that the blocks are, in fact, appearing out of nowhere due to the "background mismatch". In addition, Rockman 7's blocks don't appear to push outward, but Rockman & Forte's do. However... One could argue that all Yoku Blocks do appear from nowhere. Why, for example, would the blocks in Elecman's stage go from a dull brown color to a literal shiny orange-gold color just because they're coming in fron the background? A game engine explanation would be that this is done to make them appear different from the background, but looking at it from other perspectives? I can't believe they're selling stuff like this, I could have farted the same game out in less than a day. Nice music variations though I guess! As for the discoloration in the earlier games however, I think it's just to emphasize that the block is now in the foreground. 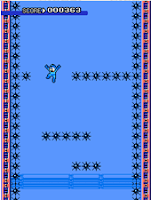 I still feel that the intent of the original Rockman developers was to show that the "disappearing" blocks were platforms extending from the wall (which could be said for nearly every platform ever in the Mega Man games aside from a few odd stages such as Bomb Man's and Air Man's).